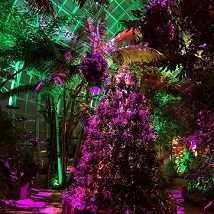 Enjoy a new take on holiday lighting inside the Crystal Bridge Tropical Conservatory beginning November 23 through January 2nd. Illuminations: A Northern Lights Experience in the Crystal Bridge is presented by OG&E. Sponsored by Devon Energy, Delta Dental of Oklahoma and Tinker Federal Credit Union. Professional designers using the latest lighting technology are taking our holiday display to the next level, beyond strings of lights. Bring your out-of-town guests and show off the best of your city!